Goodreads Summary: Every summer the trucks roll in, bringing the carnival and its infinite possibilities to town. This year Tessa and her younger sister Lulu are un-chaperoned and want to be first in line to experience the rides, the food... and the boys. Except this summer, jealousy will invade their relationship for the first time, setting in motion a course of events that can only end in tragedy, putting everyone's love and friendship to the test. What I Think: Such an interesting novel that will definitely get a second read. 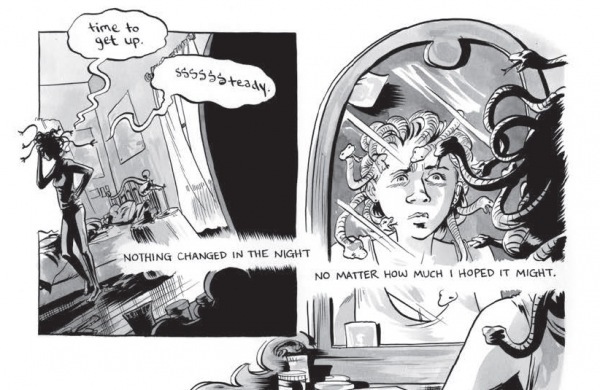 Told in a dual format of prose and graphic novel, Cecil Castellucci tells us the story of two very different girls- One is a modern day Medusa who hates what she has become and keeps turning everyone she loves into stone; the other is a teenage girl filled with jealousy for her younger sister who is dating the boy of her dreams. When finished with the book, you will definitely see why I want to go back and reread. The Year of the Beasts is one of those books that exudes teen angst right from its core. Both girls have such a repulsion filling their being that it is almost hard to read at times; however, also hard to stop. And it is a feeling that almost all of us felt in those high school years. I found it fascinating how the author used the Greek monster, Medusa, to embody one of her characters. She along with other monsters and creatures in the graphic novel section, are symbols for the person inside of the monster. It is so much more than it seems on the surface. I'll be completely honest; I was so confused throughout most of the book. Not because either story is confusing, but because I didn't understand how they fit together. They seemed like such a dichotomy, but there is a method to the madness that makes it all the more powerful. This book will be one that the reader will have trouble forgetting. Writing Prompts: When you finished The Year of the Beasts, what do you think Medusa represented? What connections did you make between the graphic novel and prose after seeing the resolution? ; Put the events of both the prose and graphic novel into sequential order.